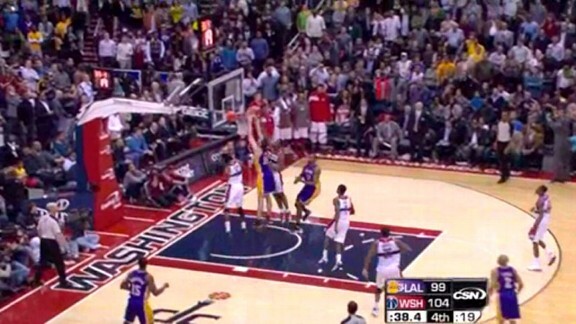 With 43 seconds remaning, the Lakers trailed the Wizards by five on Wednesday. Late in games, coaches need to understand the clock and score in order to determine whether they need a 3-point shot or a quick 2. Last night, the Lakers’ staff decided on the quick 2, and they ran a play designed to score quickly enough that it would mean they did not have to foul on defense. 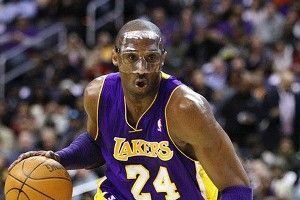 As the basketball goes to the trigger man, Metta World Peace, the Lakers are set up in a box formation — the guards (Kobe Bryant and Derek Fisher) on the blocks and the bigs (Pau Gasol and Andrew Bynum) at the elbows. As soon as World Peace gets the ball, the Lakers execute a zipper action with Bryant coming off of a pin-down screen set by Gasol. 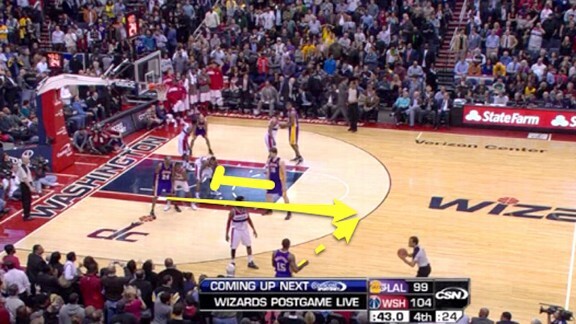 This makes Bryant available for the ball, and he receives it just outside the 3-point line. As soon as Bryant makes the catch, the same action takes place on the other side, as Andrew Bynum sets a pin-down screen for Derek Fisher. Once Fisher comes off the screen, he moves to the top of the key and sets a ball screen for Bryant. The Lakers are forcing Fisher’s defender to be the decision-maker and playing off whatever his man does. 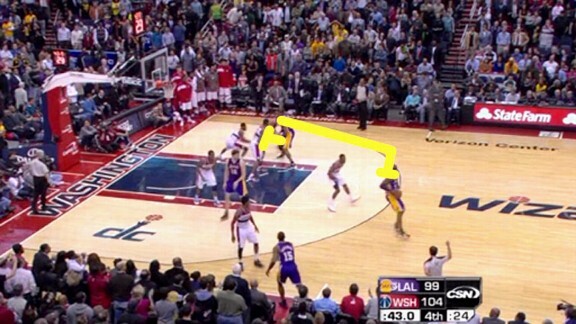 As Fisher gets in position to set the screen, his man shoots out to trap Bryant. This allows Fisher to slip the screen and pop out to the 3-point line on the weakside wing. What I like about this play is that there was a second option. If Fisher’s man had stayed home, Andrew Bynum would have set a second ball screen for Bryant, who probably would have used it to get a quick 3-point shot. Bryant does a good job of reading the defense, and quickly gets the ball to Fisher. 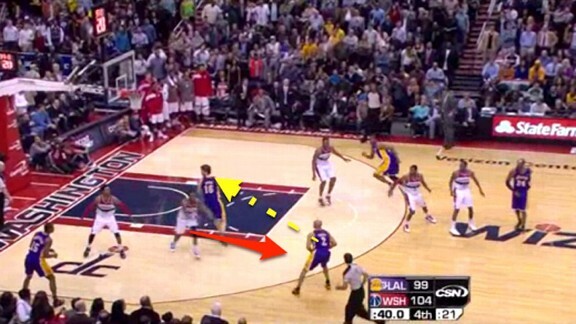 The pass means that two Wizards now have to defend three Lakers. With Fisher holding the basketball behind the 3-point line, the defense is forced to close out on him, given his knack for hitting big 3s. Nick Young, the second defender on this side, chooses to stay home on World Peace and not give up the corner 3-point shot. This means Gasol is able to roll to the rim wide-open, and Fisher does a great job of finding him and hitting him with the pass. Gasol makes the catch and finishes with a strong dunk before any of the Wizards’ help defenders can make a play on the ball. After the dunk, there are 37.9 seconds left on the clock. That easy bucket took just 5.1 seconds. The Wizards’ lead was cut from five to three, turning it into a one-possession game with over 24 seconds left on the clock. The Lakers basically executed a two-for-one to perfection, and then did not have to foul on their next defensive possession to get the ball back. This gave them a chance to tie the game without having to rely on missed free throws. The only problem here was that the Lakers were unable to secure the defensive rebound and their offense never had a chance to tie the game. 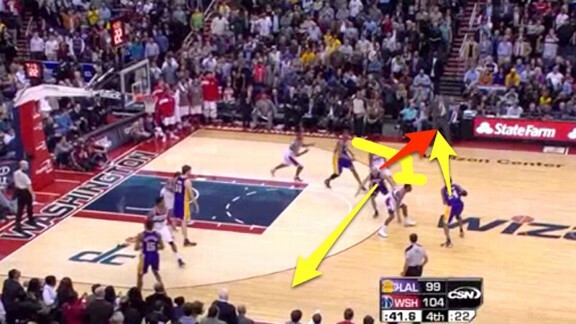 Regardless of the result, this was a great play drawn up by the Lakers coaches, and because it was well executed, they still had a chance at the end.